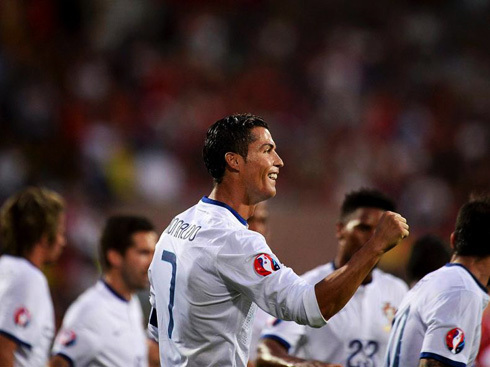 Portugal got the job done in Armenia this Saturday evening by accomplishing a tough 2-3 win, in a game where Cristiano Ronaldo shined again with another stunning hat-trick. The Portuguese National Team are now in cruise control on the top of their group in the EURO 2016 qualifiers, with 4 wins in 5 games. Portugal made another important step in order to make sure they won't be missing next year's EURO 2016, as they've visted Armenia and beat the locals by 2-3. After a reasonably sloppy start in the game that ended up costing the Selecção an early goal, Ronaldo then decided to put on a show in his last official game of the season and scored 3 straight goals that would make all the difference in the outcome of this clash. Portugal are now on top of Group I with 12 points in 5 games, while Denmark is second with 10 and Albania is third with 7, but with still one game in hand. 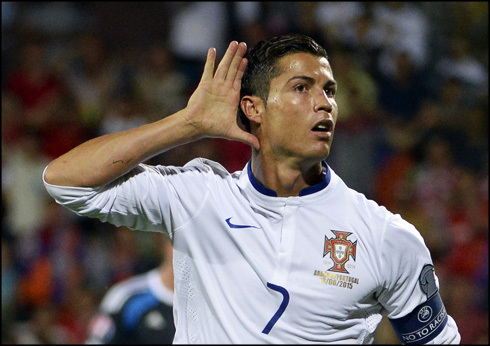 Fortunately, however, the reaction would come on still before the half-time and when João Moutinho was taken down inside Armenia's box, the home fans immediately knew that it was only a matter of time for Ronaldo to get his name on the scoresheet. And so it was, the Real Madrid forward scored the equalizer from the penalty spot in the 29th minute and allowed Portugal to take a deep breath and redefine their strategy for the 2nd half. The advantage goal for the Selecção arrived around the 10th minute of the second half, when a long ball sent into the back of the Armenia's defense ended up leading to a miscommunication between their center defender and their goalkeeper. With Cristiano Ronaldo lurking nearby, the hosts should have known that any mistake like that could cost them a goal and eventually the game. The Portuguese striker never gave up and with a skillful touch he lobbed the ball over the Armenian's goalkeeper head to make it 1-2 for Portugal. As if those two goals hadn't been enough already to leave his mark in this game, Ronaldo completed his hat-trick just four minutes later and this time with a true rocket from outside the box. The former Manchester United star picked up a high ball just a few meters ahead of the midfield line, moved forward until someone closed down on him and then fired a bullet into the top right corner of Berezovsky's goal. A 2-goal cushion for the Portuguese National Team and another brilliant display from their main man, Cristiano Ronaldo. With Tiago sent off around the 62nd minute after seeing a second yellow card in the game, the home side still managed to cut the lead to a single goal after a close range rebound from Mkoyan in the 72th minute. The Selecção regrouped though and held down the fortress in the remaining 20 minutes of the game, bringing home these important 3 points in their EURO 2016 qualification campaign. Portugal will stay play a friendly against Italy next Tuesday in Geneva, but Cristiano Ronaldo was already dismissed from the camp in order to start enjoying his much-deserved vacations. Cristiano Ronaldo next game will be for the Portuguese National Team, on the 16th of June of 2015. You can watch Juventus live stream, Portugal vs Italy, Belarus vs Spain, Slovenia vs England, Brazil vs Peru, and Colombia vs Venezuela, all matches provided from our football streams section.